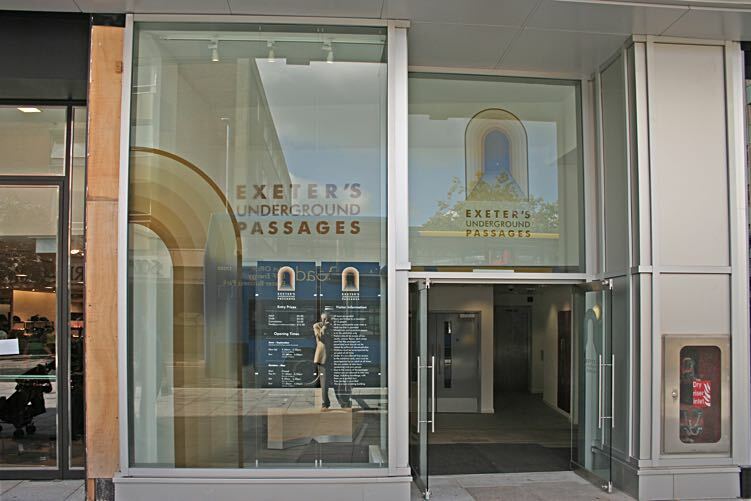 The history of Exeter's famous underground passages is complex. This page is a simplified account ot this important piece of Exeter's historic heritage. The early water supply came from springs that appeared naturally at the surface, allowing the early inhabitants to establish a settlement. The Roman garrison had sourced water from springs in the St Annes Well area of St Sidwells along an aqueduct that entered the city near to the Harlequins Shopping Centre, according to Hoskins. Five hundred years later, the Saxon Minster was supplied by water from a spring under the present Cathedral which had, over the millenia, cut a little valley down to the Exe, now covered by Coombe Street. It was the loss of the spring in Cathedral Close when the Norman Cathedral was built, that required a new source of water to be tapped. 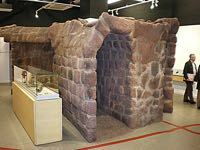 There had been springs in St Sidwells, from before the Roman occupation, which appeared through a bed of porous sandstone, known as the Whipton Beds. One of these springs, known as the Cathedral Headwell, now on the bank above St James' Park Holt, fed a lead pipe sunk in a trench along Longbrook Street, through the city wall to the St Peter's Conduit by the Cathedral. 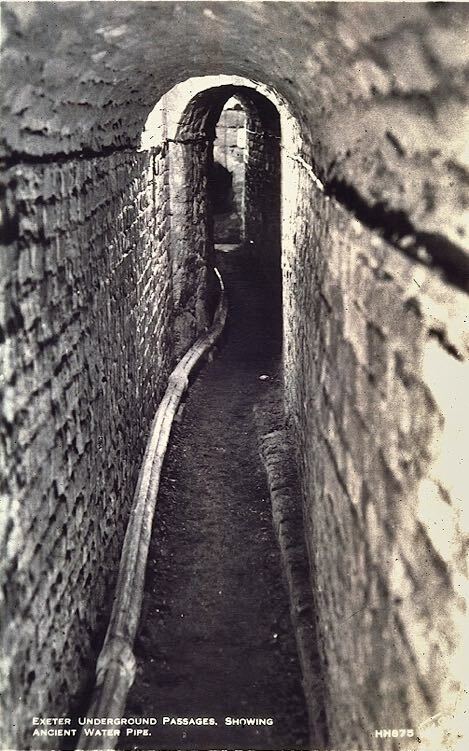 Maintenece was a problem, so the Cathedral Authorities decided to build a passage, along the top of Longbrook Street, from outside the city wall at Eastgate, under the wall to the garden of St John's Hospital to carry the pipe–this is thought to be the first of the underground passages. Later, a spur carried a supply to Blackfriars Priory, under the new Debenhams. By the late 13th Century, a spring at the top of Well Street fed the city water supply, along a trenched lead pipe, running parallel to the Cathedral supply, in Longbrook Street. The spring had a rather smaller output than the Cathedral spring, so an 'adit' or underground channel was dug across the road, into a field to a second spring to fortify the supply. This 'adit' was under the present football ground. 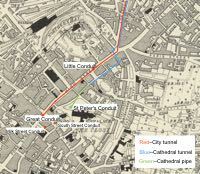 In 1420, a new buried pipe system was dug along the High Street to the Carfax at the top of Fore Street. 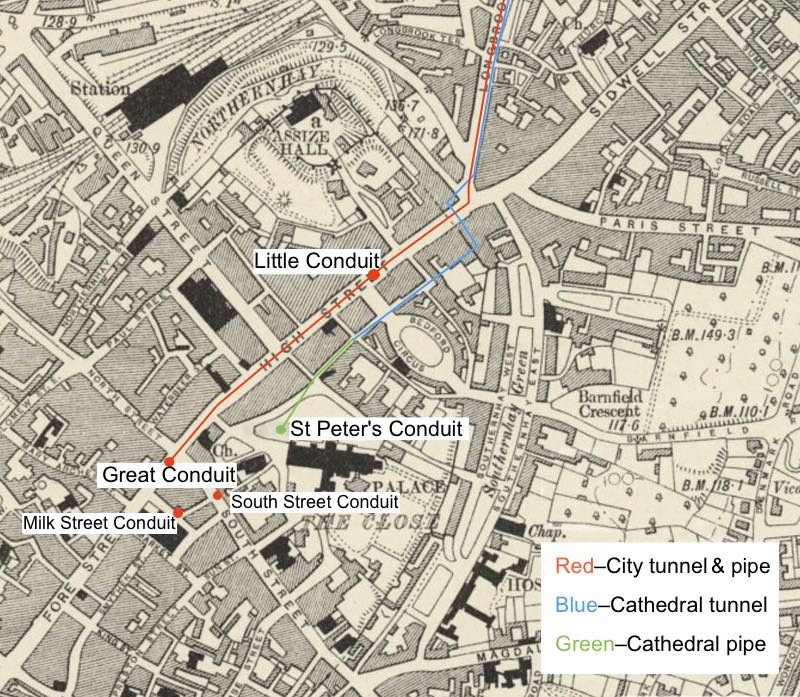 In 1492, this pipe was replaced when sections of passage under Eastgate were tunnelled, as far as St Stephens Church, and a three inch lead pipe laid–it was carried in a trench, on as far as the Great Conduit at the Carfax. 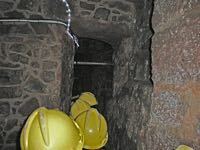 It is thought that the tunnelled section was constructed by digging a trench in the clay, lining it with cut Heavitree stone and adding capping stones. Access was provided for maintenance. 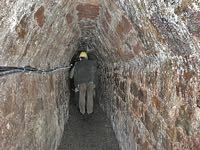 The tunnel was lined with Heavitree stone and was cut through a layer of compacted gravel that some think was a Roman road. Archaeologists have also found shards of Roman pottery, but this does not indicate that the passage was of Roman origin. By the Civil War the city besieged by Parliamentary forces considered the passage under the wall to be a security risk, so the lead was removed, for casting into bullets, and the passage filled with rubble. After the war, in 1655, the passages were repaired and the water supply restored. However, the water supply for the fast growing city was proving to be inadequate and in 1694 a wheel driven 'water engine' was built just below Head Weir, on the Exe, which pumped water through wooden pipes to a tank at the rear of the Guildhall. Between 1805 and 1833 James Golsworthy was employed to maintain and improve the water system and in 1811, he introduced the first cast iron pipes in England, into the underground passages. St Nicholas Priory built an elaborate, circular wash-house that dated from circa 1170, which archaeologistsnow believe was fed with a supply from St Paul's Well in Paul Street. The cholera epidemic of 1832 was a shock to the City Chamber and a more modern water system planned. The Pynes water works opened in 1835, followed by the holding reservoir at Danes Castle in 1852. The passages still supplied water to the city, but in 1857, Headwell Mead (the Cathedral supply) was damaged by the new railway cutting for the London and South Western Railway and the supply for the cathedral ceased. 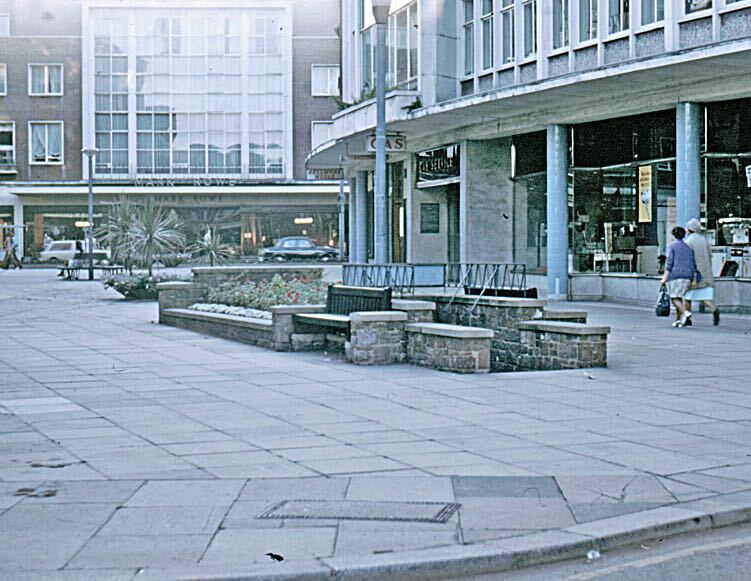 When Princesshay was built after the war, an entrance was constructed to allow visitors to inspect the passages. 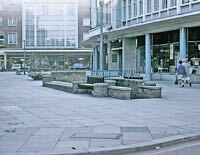 The entrance was removed and replaced by the Exeter Blitz Fountain in 1992, and a new entrance to the passages with an interpretation centre was opened in Roman Gate, next to Boots. In 2007, a new entrance to the Underground Passages was opened in Paris Street, with a new £175,000 interpretation centre. It was opened by Time Team's Tony Robinson. Sources - www.exeter.gov.uk website article, a Transactions of the Devonshire Association article by Aileen Fox in 1950, Two Thousand Years in Exeter by W G Hoskins. Water in the City by Mark Stoyle. The figure indicates how tight the passage is–this is somewhere near Boots. 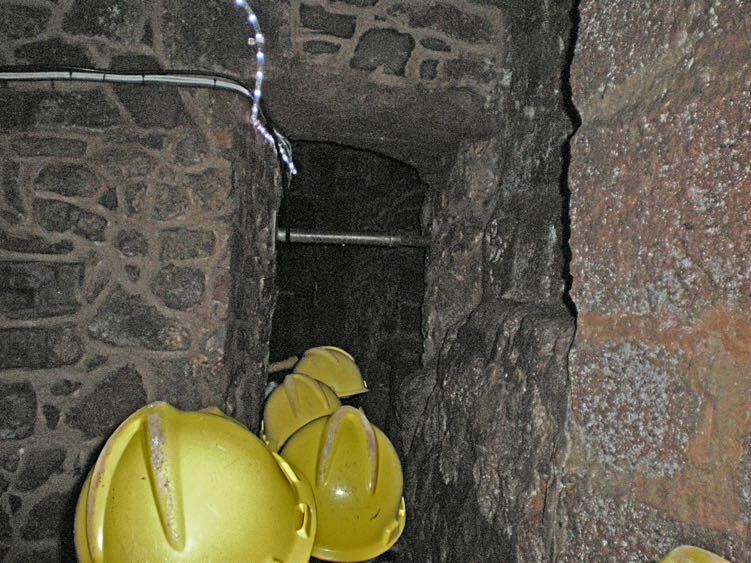 Hard hats are required to visit the passage. An early postcard of the passages. They were recognised as an important tourist attraction early in the 20th Century. 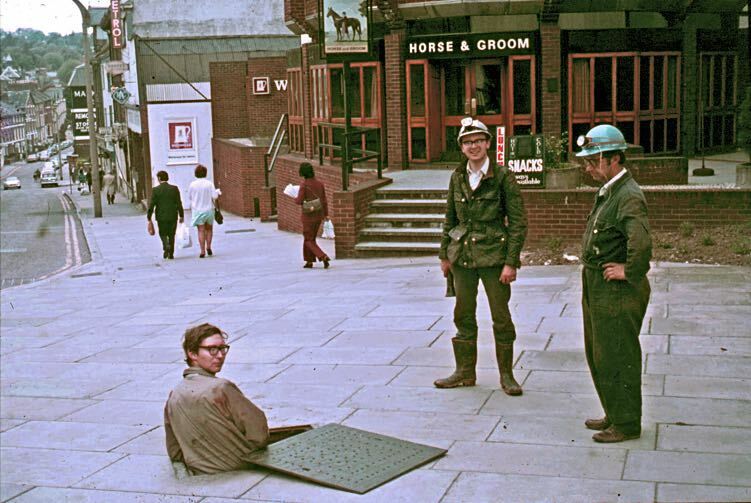 Dropping through a manhole cover into the passage running at the top of Longbrook Street Photo Alan H Mazonowicz. The entrance to the passage in Princesshay. 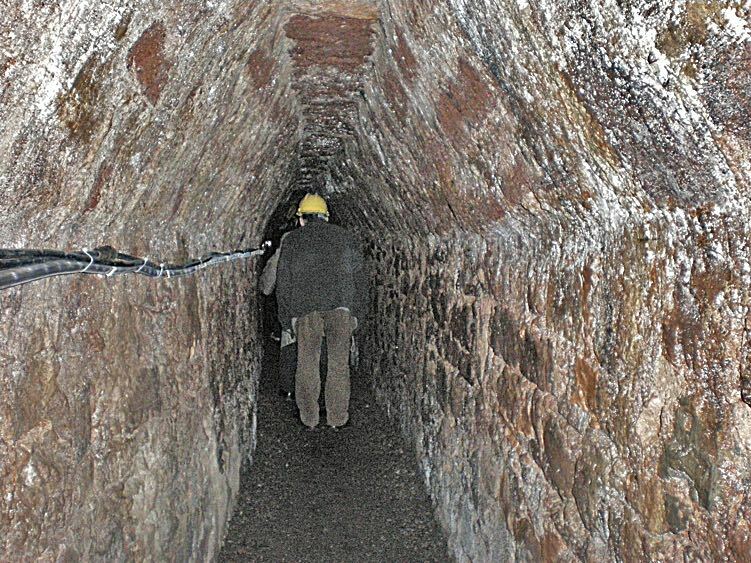 The entrance to the passages in Roman Way. It closed when the new interpretation centre opened in Paris Street. The entrance to the passages in Paris Street. A reconstruction of the passages in the interpretation centre–useful for those who suffer with claustrophobia, and don't want to enter the real passage.